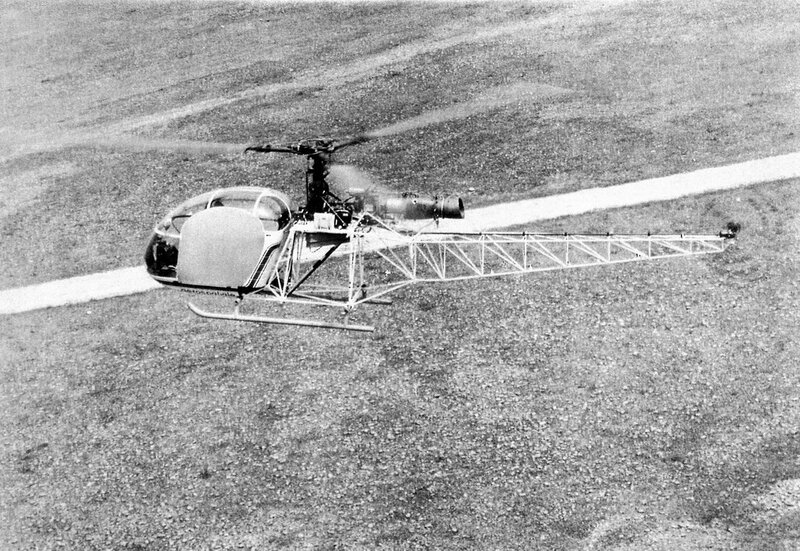 17 March 1969: First flight, Société nationale des constructions aéronautiques du Sud-Est test pilot Roland Coffignot and flight engineer Gérard Boutin made the first flight of the prototype SA 315A Lama, serial number 315-001. 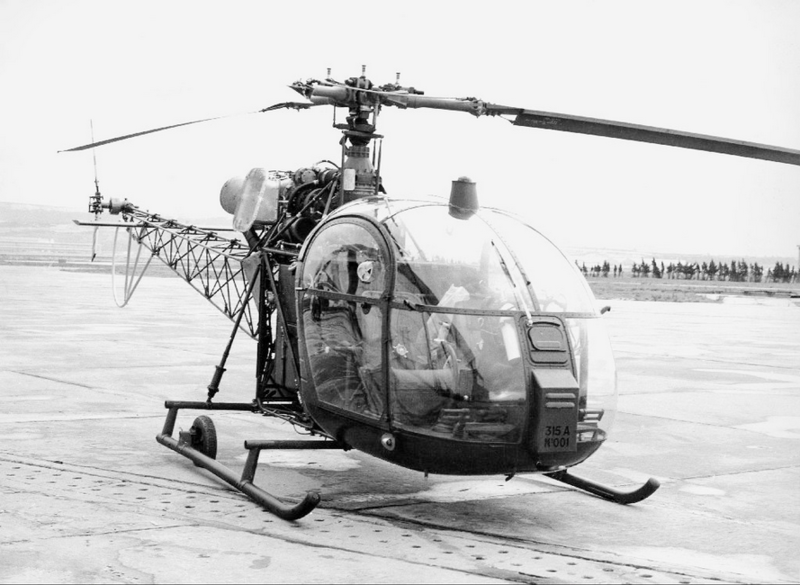 The new helicopter combined the airframe of the SNCASE Alouette II with the drive train and rotors of the Alouette III. The helicopter was built to meet the specific needs of the Indian Air Force for operations in the Himalayan Mountains. It was required to take off and land at an altitude of 6,000 meters (19,685 feet) while carrying a pilot, one passenger and 200 kilograms (441 pounds) of cargo. The SA 315A was able to exceed this, landing at taking of in the Karakoram Mountains at 6,858 meters (22,500 feet). 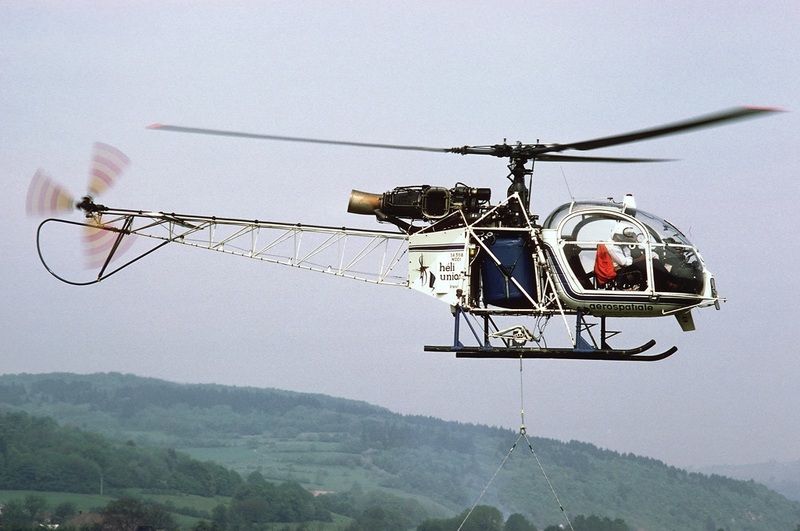 The SA 315 B Lama is a 5-place light helicopter powered by a turboshaft engine. It is operated by a single pilot. The fuselage is 10.236 meters (33 feet, 7.0 inches) long. With rotors turning, the helicopter has an overall length of 12.919 meters (42 feet, 4.6 inches) and height of 3.090 meters (10 feet, 1.7 inches). The SA 315 B has an empty weight of 1,021 kilograms (2,251 pounds) and a maximum gross weight of 1,950 kilograms (4,300 pounds). With an external load carried on its cargo hook, the allowable maximum gross weight is 2,300 kilograms (5,070 pounds). The three-bladed, fully-articulated main rotor has a diameter of 11.020 meters (36 feet, 1.9 inches). It turns clockwise, as seen from above. (The advancing blade is on the left side of the helicopter.) Normal main rotor speed, NR, is 350–360 r.p.m. The range in autorotation ins 270–420 r.p.m. The three-bladed anti-torque tail rotor is mounted on the left side of the tail boom in pusher configuration. It is 1.912 meters (6 feet, 3.3 inches) in diameter and turns clockwise, as seen from the helicopter’s left side. (The advancing blade is below the axis of rotation.) It turns at 2,020 r.p.m. The Lama was initially powered by a Societé Anonyme Turboméca Artouste III B (later aircraft, Artouste III B1) turboshaft engine. This is a single-shaft engine with a single-stage axial-flow, single-stage centrifugal flow, compressor section and a three-stage turbine. The engine turns 33,500 r.p.m. and the output drive shaft turns 5,773 r.p.m. The Artouste III B1 produces a maximum 870 horsepower, but is derated to 570 horsepower for installation in the Lama. The engine is 1.815 meters (5 feet, 11.5 inches) long, 0.667 meters (2 feet, 2.3 inches) high and 0.520 meters (1 foot, 8.5 inches) wide. It weighs 178 kilograms (392 pounds). The helicopter has a cruise speed 98 knots (113 miles per hour/181 kilometers per hour) and a maximum speed (VNE) of 113 knots (130 miles per hour/209 kilometers per hour) at Sea Level. Sideward or rearward flight (or operations in crosswinds or tailwinds) are restricted to 18 knots. The maximum operating altitude is 7,000 meters (22,966 feet). At 1,950 kilograms (4,299 pounds), the Lama has a hover ceiling in ground effect (HIGE) of 5,050 meters (16,568 feet), and out of ground effect (HOGE), 4,600 meters (15,092 feet). 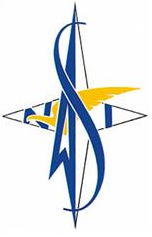 Société nationale des constructions aéronautiques du Sud-Est became Societe nationale industrielle aérospatiale (SNIAS) in 1970. The company produced the SA 315 B Lama beginning in 1971. It was also built under license by Hindustan Aeronautics in India and Helibras in Brazil. The total number of SA 315 Bs and its variants built is uncertain. 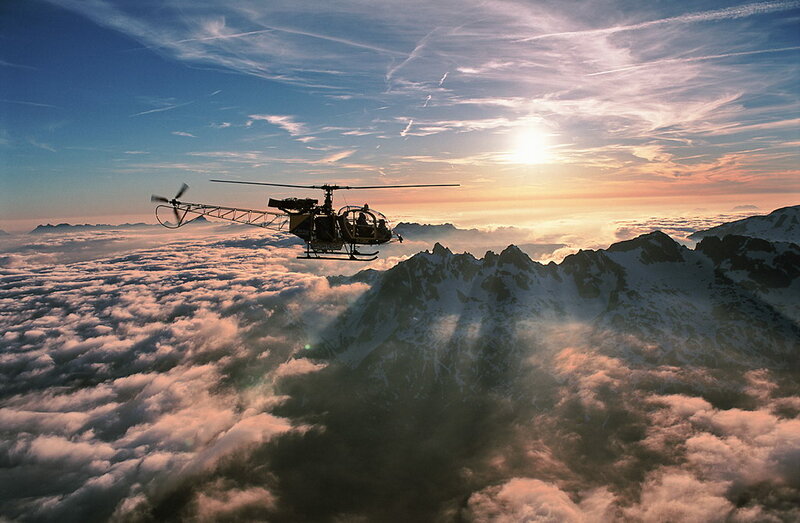 In 2010, Eurocopter, the successor to Aérospatiale, announced that it will withdraw the Lama’s Type Certificate in 2020. ¹ FAI Record File Number 788. ² FAI Record File Numbers 753, 754 and 11657. 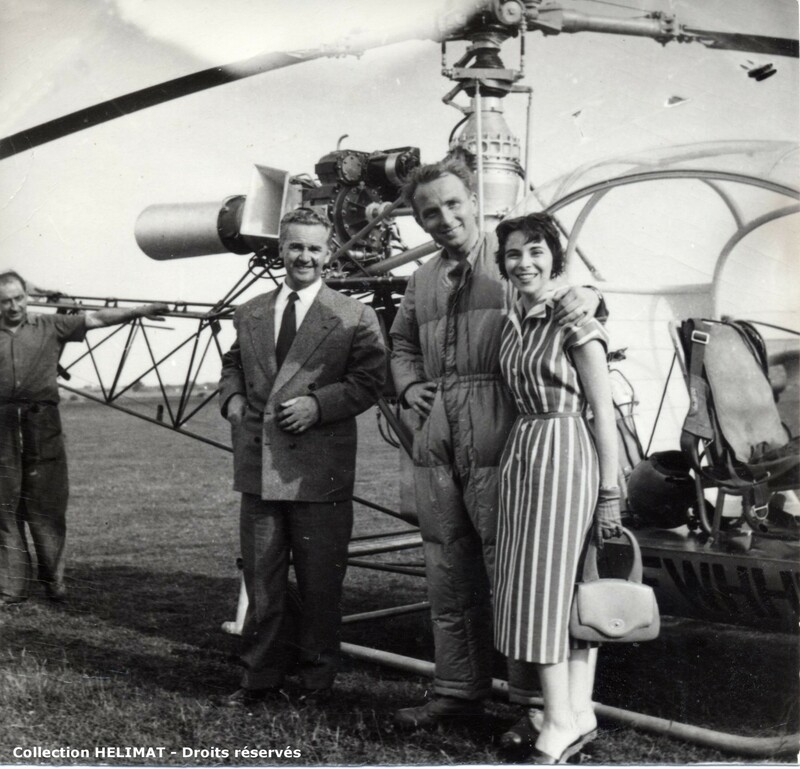 21 June 1972: Aérospatiale Chief Test Pilot Jean Boulet set a Fédération Aéronautique Internationale (FAI) Absolute World Record for helicopters by flying the first Aérospatiale SA 315 Lama, serial number 315-001, to an altitude of 12,442 meters (40,820 feet) from Aérodrome d’Istres, northwest of Marseille, France.¹ He also set two class and sub-class world records.² These records remain current. The SA 315B Lama was designed to perform at the very high altitudes and temperatures necessary for service with the Indian Army. It combined an SE.3130 Alouette II airframe with a much more powerful Turboméca Astazou IIIB turboshaft engine—derated to 550 shaft horsepower—and the rotor system, transmission and gearboxes from the larger 7-place Alouette III. The record-setting helicopter was modified by removing all equipment that was not needed for the record flight attempt. 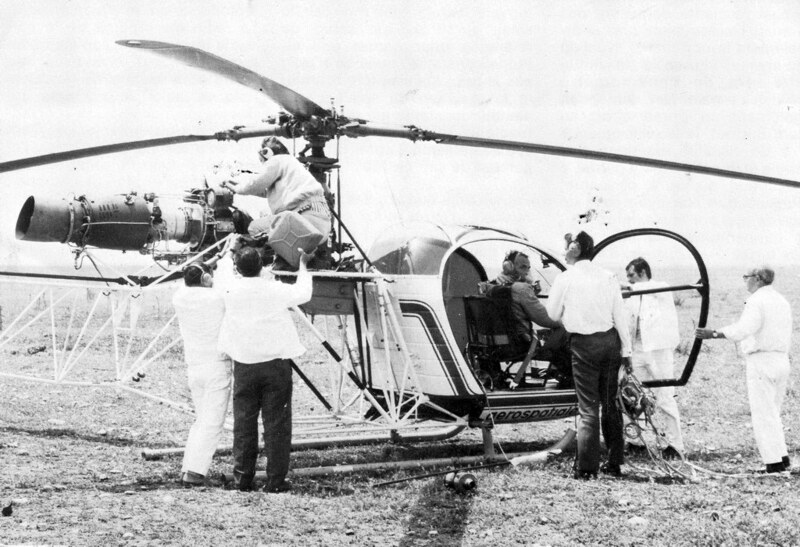 Various instruments and the co-pilot and passengers seats were taken out of the cockpit, as well as the helicopter’s synchronized horizontal stabilizer and tail rotor guard. The standard fuel tank was replaced with a very small tank holding just 70 kilograms (approximately 22.7 gallons) of jet fuel. Turboméca modified the engine to increase the output shaft r.p.m. by 6%. After Jean Boulet started the turbine engine, mechanics removed the battery and starter motor to decrease the weight even further. In just 12 minutes, the Lama had climbed to 11,000 meters (36,089 feet). As he approached the peak altitude, the forward indicated airspeed had to be reduced to 30 knots (34.5 miles per hour, 55.6 kilometers per hour) to prevent the advancing main rotor blade tip from reaching its Critical Mach Number in the thin air, which would have resulted in the blade stalling. At the same time, the helicopter was approaching Retreating Blade Stall. 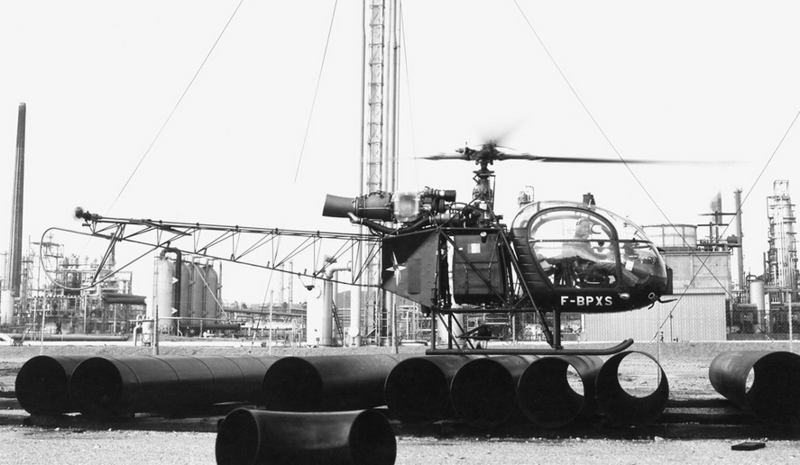 When the helicopter could climb no higher, Boulet reduced power and decreased collective pitch. The Turboméca engine, not calibrated for the very high altitude and cold temperature, -62 °C. (-80 °F. ), flamed out. With no battery and starter, a re-start was impossible. Boulet put the Lama into autorotation for his nearly eight mile descent. Entering multiple cloud layers, the Plexiglas bubble iced over. Because of the ice and clouds, the test pilot had no outside visibility. Attitude instruments had been removed to lighten the helicopter. Boulet looked up through the canopy at the light spot in the clouds created by the sun, and used that for his only visual reference until he broke out of the clouds. Still in autorotation, the SA 315 missed touching down exactly on its takeoff point, but was close enough that FAI requirements were met. Two days earlier, 19 June 1972, Boulet and fellow test pilot Gérard Boutin had set another FAI World Record for Altitude Without Payload, when they flew the Lama to 10,856 meters (35,617 feet).³ This record also still stands. The SA 315B Lama is a 5-place light turboshaft-powered helicopter which is operated by a single pilot. The helicopter was built to meet the specific needs of the Indian Air Force for operations in the Himalayan Mountains. It was required to take off an land at an altitude of 6,000 meters (19,685 feet) while carrying a pilot, one passenger and 200 kilograms (441 pounds) of cargo. The fuselage is 10.26 meters (33 feet, 7.9 inches) long. With all rotors turning, the helicopter has an overall length of 12.92 meters (42 feet, 4.7 inches) and height of 3.09 meters (10 feet, 1.7 inches). The SA 315B has an empty weight of 1,021 kilograms (2,251 pounds) and a maximum gross weight of 1,950 kilograms (4,299 pounds). With an external load carried on its cargo hook, the maximum gross weight is 5,070 pounds (2,300 kilograms). The three-bladed, fully-articulated main rotor has a diameter of 11.02 meters (36 feet, 1.9 inches). It turns clockwise, as seen from above. (The advancing blade is on the left side of the helicopter.) Normal main rotor speed, NR, is 350–360 r.p.m. 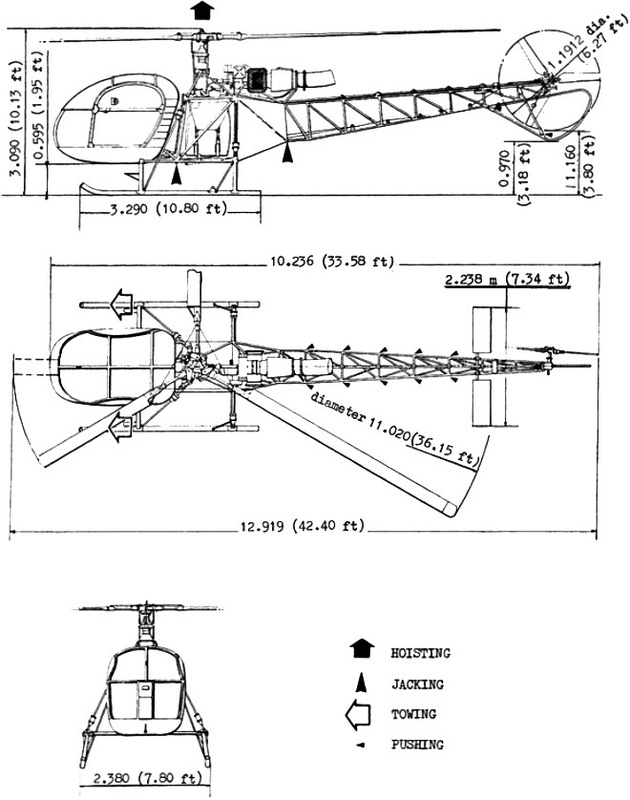 The three-bladed anti-torque tail rotor is 1.91 meters (6 feet, 3.2 inches) in diameter and turns clockwise, as seen from the helicopter’s left side. (The advancing blade is below the axis of rotation.) It turns at 2,020 r.p.m. The Lama was initially powered by a Turboméca Artouste IIIB (later aircraft, Artouste IIIB1) turbo-moteur. This is a turboshaft engine with a two-stage compressor section (1 axial-flow, 1 centrifugal-flow stages), and a three-stage axial-flow turbine. The engine turns 33,500 r.p.m. and the output drive shaft turns 5,773 r.p.m. The Artouste IIIB1 produces a maximum 870 horsepower, but is derated to 570 horsepower for installation in the Lama. The engine is 1.815 meters (5 feet, 11.5 inches) long, 0.667 meters (2 feet, 2.3 inches) high and 0.520 meters (1 foot, 8.5 inches) wide. It weighs 178 kilograms (392 pounds). The helicopter has a cruise speed 103 knots (191 kilometers per hour, 119 miles per hour) and a maximum speed of 113 knots (209 kilometers per hour, 130 miles per hour) at Sea Level. The service ceiling is 5,400 meters (17,717 feet). At 1,950 kilograms (4,299 pounds), the Lama has a hover ceiling in ground effect (HIGE) of 5,050 meters (16,568 feet), and out of ground effect (HOGE), 4,600 meters (15,092 feet). 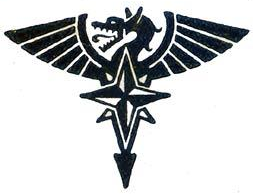 Société nationale des constructions aéronautiques du Sud-Est became Aérospatiale in 1970. The company produced the SA 315B Lama beginning in 1971. It was also built under license by Hundustan Aeronautics in India and Helibras in Brazil. The total number of SA 315Bs and its variants built is uncertain. In 2010, Eurocopter, the successor to Aérospatiale, announced that it will withdraw the Lama’s Type Certificate in 2020. After setting the world altitude record, 315-001 was returned to the standard configuration and assigned registration F-BPXS. It crashed at Flaine, a ski resort in the French Alps, 23 February 1985. 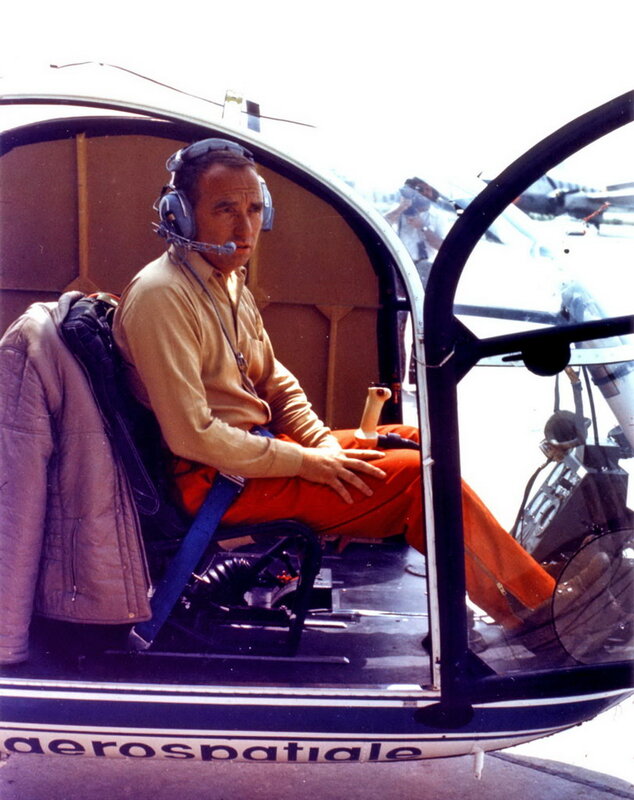 Jean Boulet with a SNCASE SE.3130 Alouette II. In 1943, Jean Boulet married Mlle. Josette Rouquet. They had two sons, Jean-Pierre and Olivier. In February 1945, Sous-lieutenant Boulet was sent to the United States for training as a pilot. After basic and advanced flight training, Bouelt began training as a fighter pilot, completing the course in a Republic P-47D Thunderbolt. He was then sent back to France along with the other successful students. 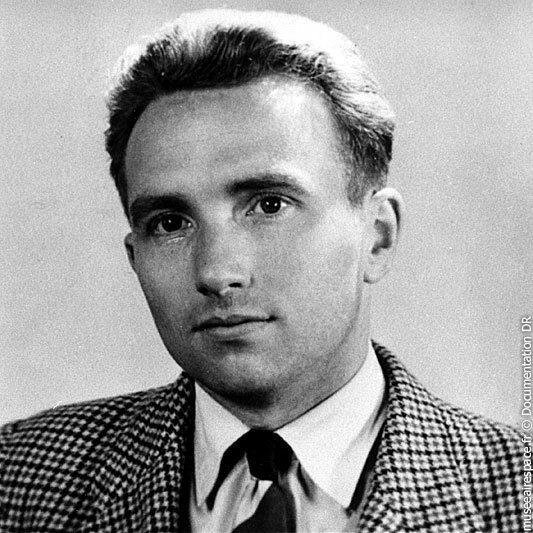 On 1 February 1947 Jen Boulet joined Société nationale des constructions aéronautiques du Sud-Est (SNCASE) as an engineer and test pilot. He returned to the United States to transition to helicopters. Initially, Boulet and another SNCASE pilot were sent to Helicopter Air Transport at Camden Central Airport, Camden, New Jersey, for transition training in the Sikorsky S-51. An over-enthusiastic instructor attempted to demonstrate the Sikorsky to Boulet, but lost control and crashed. Fortunately, neither pilot was injured. Boulet decided to go to Bell Aircraft at Niagara Falls, New York, where he trained on the Bell Model 47. 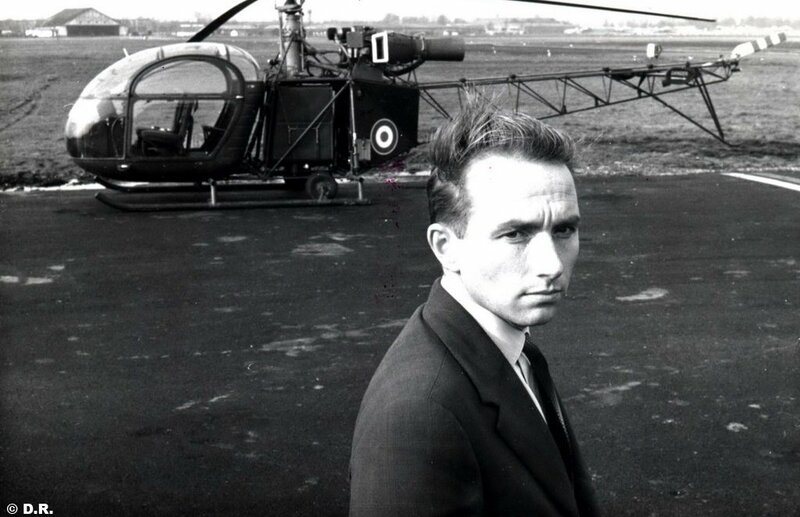 He was awarded a helicopter pilot certificate by the U.S. Federal Aviation Administration, 23 February 1948. ² FAI Record File Number 753: Altitude Without Payload: Sub-Class: E-1b (Helicopters: take off weight 500 to 1000 kg). 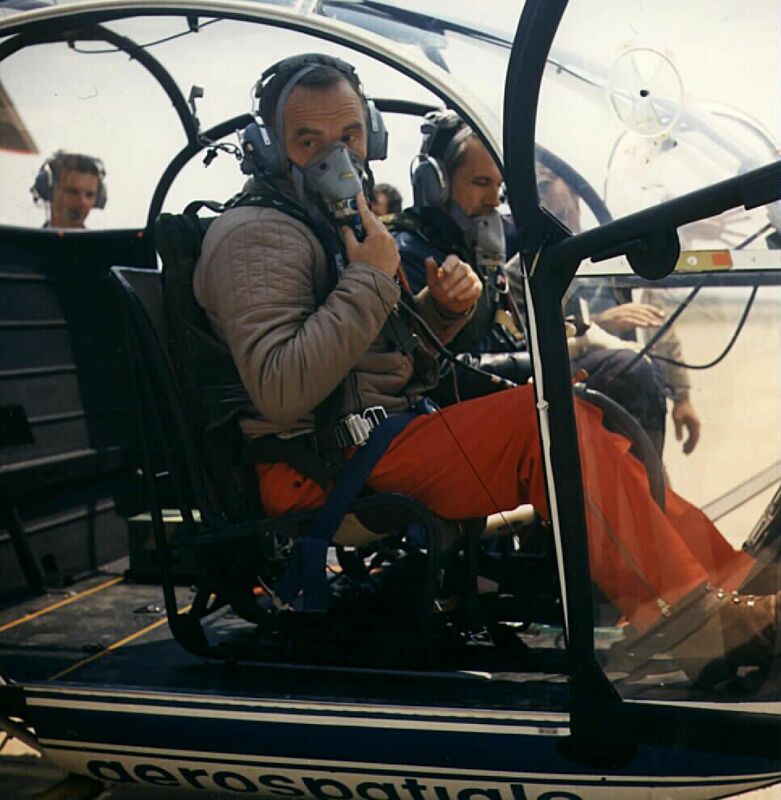 FAI Record File Number 754: Altitude Without Payload: Sub-Class: E-1 (Helicopters). ³ FAI Record File Number 788: Altitude Without Payload: Sub-Class E-1c.